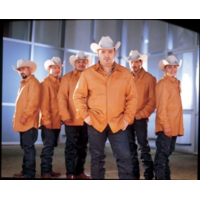 Grammy award winning superstar group Intocable (Untouchable) is a Tejano/Norteño musical group from Zapata, Texas that was started by friends Ricky Muñoz and René Martínez in the early 90's. Within a couple years as a band, Intocable had already risen to the top of the Tejano and Norteño fields with a musical signature that had fused Tejano's robust conjunto and Norteño folk rhythms with a pop balladry. Currently, Intocable could very well be the most influential group in Tejano, and their tough Tejano/Norteño fusion has become the blueprint for dozens of Tex-Mex groups. The group's strengths, which include romantic hooky melodies, and tight instrumentation and vocal harmony is consistently being imitated by a list of other Tejano and Norteño groups. This list includes groups such as Imán, Duelo, Costumbre, Solido, Estruendo, Intenso, and Zinzero among others. Career accomplishments include four consecutive sold-out nights at Mexico City's prestigious Auditorio Nacional and the group's 2003 headlining appearance at Reliant Stadium in Houston, which drew a record 70,104 fans. They also played two sold-out dates at the 10,000-capacity Monterrey Arena in Monterrey, Mexico. It was an unusual accomplishment, given that Norteño groups typically play large dance halls and rarely arenas, unless it's an all day festival event. Intocable has also won at least eight of Univision's Premio Lo Nuestro awards, and received their first Grammy win in February 2005 at the 47th Annual Grammys (Grammy Award for Best Mexican/Mexican-American Album Album; Intimamente). Life hasn't always been this kind to the group, though. The band's first indie albums barely sold. In August of 1994 their album Fuego Eterno, with new label EMI Latin, had notable sales. The music of Ramón Ayala influenced the direction of the band. The band's lead vocalist and accordion player, Ricky Muñoz has stated that his biggest inspiration is Ramón Ayala. In 1998, the band suffered its first major set back when two members of the band left the group to form their own. Johnny lee Rosas, (bajo sexto and 2nd voice), and Albert Ramirez, (bass), formed Grupo Masizzo. Rosas, rejoined the group in 2003 after 4 successful solo albums.